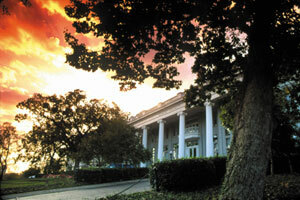 Constructed in 1890 and renovated in 1986, Freeman Hall serves as the administration building for Belmont University. The history of Belmont University begins with Adelicia Acklen, mistress of Belmont Mansion, and two schools for women which operated on the mansion’s grounds: the first Belmont College (1890-1913) and Ward-Belmont (1913-51). After a century of education on the campus (as willed by Acklen), the coeducational Belmont College became a university. As an institution of the Tennessee Baptist Convention, the second Belmont College grew from an initial 135 students to more than 2,800 in its forty-year history (1951-91). Belmont benefited from strong leaders, and only three presidents served the institution from the mid- to late twentieth Century: R. Kelly White , Herbert C. Gabhart, and William E. Troutt. The current president is Dr. Bob Fisher. The vision and fervor of these four shaped the modern history of the institution, which stresses three basic values: honesty; respect for every person; and listening and learning from everyone. The hallmark buildings lining Wedgewood Avenue provide a visual sense of the progress of the university. Music Row leads directly to the school’s front door at Freeman Hall, which is flanked by two other historic buildings–Fidelity, built during the Ward-Belmont era, and Barbara Massey Hall, home of the elegant dining halls and originally called Founders Hall. Freeman Hall connects to The Jack C. Massey Business Center. The Massey Center (1990) and Freeman Hall (1890) exhibit an architectural and ideological blend of the preservation of the past and the state-of-the-art construction for the future. Indeed, the campus today mixes the past, present, and future through the blending of nineteenth-century gazebos and artifacts created for Acklen’s country estate, as well as modern classrooms and laboratories for the twenty-first century. Representing almost every state and more than forty foreign countries, Belmont’s three thousand students choose from academic programs in fifty-seven major areas of study. Seven undergraduate and eight graduate degrees are offered through the schools of Business, Humanities/Education, Music, Nursing, Religion, Sciences, and The Jack C. Massey Graduate School of Business. The third largest private school in the state (as of 2000-2001 academic year), Belmont University for two consecutive years (1995 and 1996) was the state’s only higher education institution honored with a Tennessee Quality Achievement Award. In 1995 Belmont received the highest Innovative Management Achievement Award from the National Association of College and University Business Officers for its comprehensive management initiative. A leader in continuous quality improvement (CQI) among colleges and universities nationwide, Belmont has developed partnerships with the Nashville business community to support organizations that encourage lifelong learning. The Peer Learning Network brings together Nashville’s young executives to study world-class leadership. The Frist Center (senior living industry), The Center for Family Business (family-owned entrepreneurships), and The Center for Quality and Professional Development provide customized learning with worldwide reach. Belmont University’s vision is to be a premier teaching university, bringing together the best of liberal arts and professional education in a consistently caring Christian environment.